The Cadet burger, with added halloumi, avocado and bacon. Tomtom Mess Hall. Sounds cute, doesn’t it? It sounds like a little feasting venue, pleasantly buzzy and fit for a quick bite during a busy lunch hour. And it is, sort of. Seven of us went for lunch, in various stages of hangover (and one or two entirely bright-eyed and bushy-tailed, having missed the previous night’s festivities). We were welcomed and pushed some tables together, which was no problem despite it being a very cosy venue. 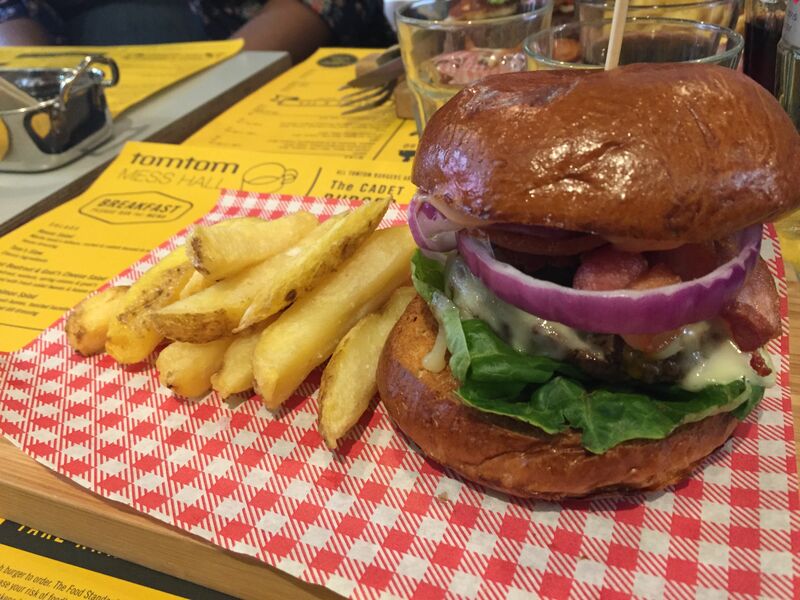 Tomtom Mess Hall has a small menu with a focus on burgers, a few salads and some desserts. It’s also licensed so you can enjoy a beer with your burger if you wish. Our orders ranged from The Cadet (a plain burger served with a side of chips, which my mate Ayse pimped out with bacon, avocado and halloumi), The Spitfire (a spicy burger served with a chilli cheese), The Airman (a chicken burger with garlic mayo) and The Mess Hall burger (a beef burger with all the trimmings). None of the burgers, aside from The Cadet, come with chips, so we each ordered them on the side and one friend ordered coleslaw as well, and was promptly told they were completely sold out. The Mess Hall burger, full of unchartered promise. I had no clue how dry the burger would turn out to be. So how was it? Well, at best the service was confused. There were mix ups with the burgers, the friend who ordered the chicken was given a vegetarian burger (and then subsequently she was served well after the rest of us because of this confusion), two friends who ordered their burgers medium had them taken away again because they received the wrong burgers, the waiter told me he would get me a knife and fork, only to walk off. And then he started wrapping knives and forks in serviettes, but not bringing one over to me. Although the staff were all pleasant and friendly, they all seemed a bit confused about why they were there, which is not what you need to help you through a red wine hangover. So, Tiffany, how was the food? Well, Dear Reader, the food was dry. That’s the best I can say about it. The brioche bun on the burger was crumbling and slightly stale, I ordered my Mess Hall burger medium rare and it was well done and VERY dry, not a hint of delicious meat juices. A lot of ketchup and mustard was reapplied during the nomming process. I wasn’t the only one, everyone else thought the buns were dry and the burgers overcooked, aside from the mate with The Airman burger, who said hers was delicious. This is the Cadet burger inside and the proof in the pudding Dear Reader. A fresh brioche bun does not cut like this, see the crumbs? So dry. Was it better than Maccys? Yes, definitely. 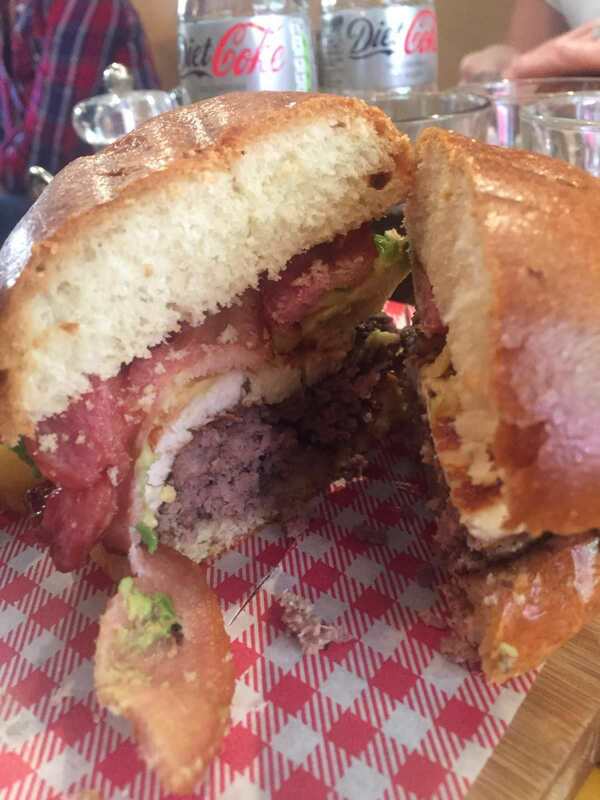 Was it worth £15 for lunch (burger, fries, Diet Coke and bacon on the burger)? No, not really. I am so disappointed, I really wanted Tomtom Mess Hall to be a hidden foodie paradise, but instead it’s just distinctly average. Sorry Tomtom. Totally agreed Tiff; such a shame! Could have been a regular..